The start of winter has begun. The radical dip in temperature from a soaring 15 degrees at night to 4 degrees feels more like -2 degrees. The dark come early now. Look around. The stores are hidden from the greyness and dullness of the winter night sky. Heads are held low as if no-one or nothing matters. Cars whizz by, the odd fox glares its bright eyes at passers-by. Shoulders are crunched, hands deep in pockets and feet moving swiftly as no-one or nothing matters. She coughed, gripping her chest as she did. “We need to get out of the cold” he said as he clutched to her with such tenderness. She was middle-aged, medium-built, fair and had unkempt mouse brown hair. She looked older than her years. Life, the streets, sickness had added extra lines to her already visible natural creases. Her fingers were numb from the cold. Her legs were achy and her chest sore from the horrendous coughing brought on by the winter bug. He held her close as he looked around the street for somewhere warm. It was his job to protect her. He’s not that much taller than her. His frail features suggested struggles and worries yet he tried to remain strong for her. Their closeness was reflected in the similar attire they wore, as well as their touch. No-one noticed them; no one noticed how she bent over with every cough; no one saw how he held her closer after each one. 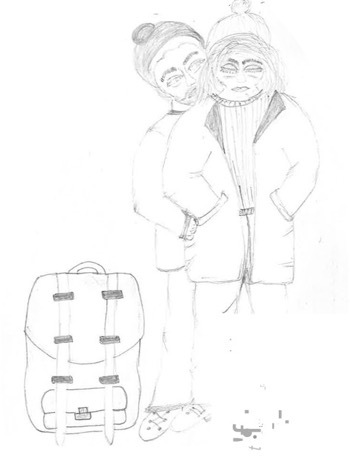 No-one noticed their backpack, bulging at the sides, or how desperate they were to find shelter, somewhere warm just for the night until they started their journey in the morning. No-one noticed their desperation. No-one noticed them. No-one noticed the couple on the street. They were homeless, sick.